Ahhh Christmas! The end of a very busy and eventful year for me and my family. You might have noticed I haven’t posted in some months. This is because we moved from Cincinnati to the Washington, D.C. area, first into an apartment and now into a fantastic townhouse. I’m finally feeling more settled and can think about making furniture and decor again! 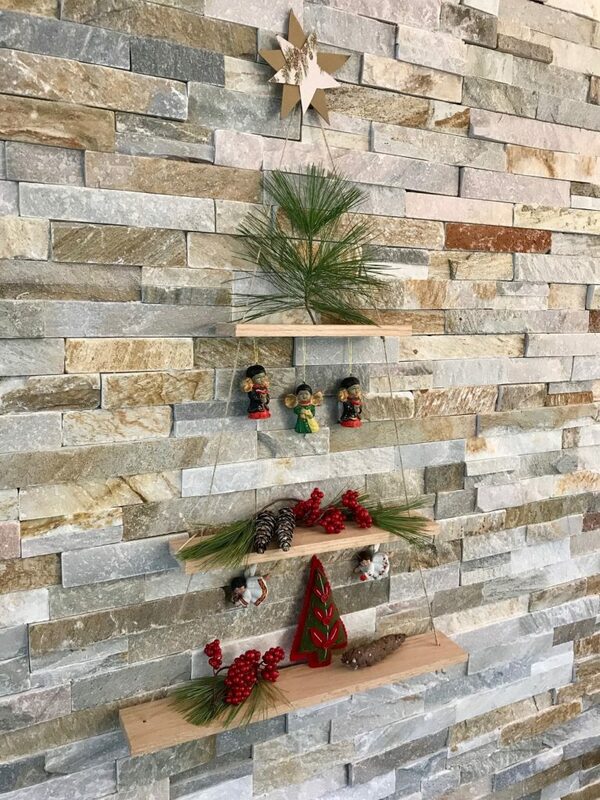 In this post I’ll show you how to make a wall shelf unit that is shaped like a Christmas Tree. 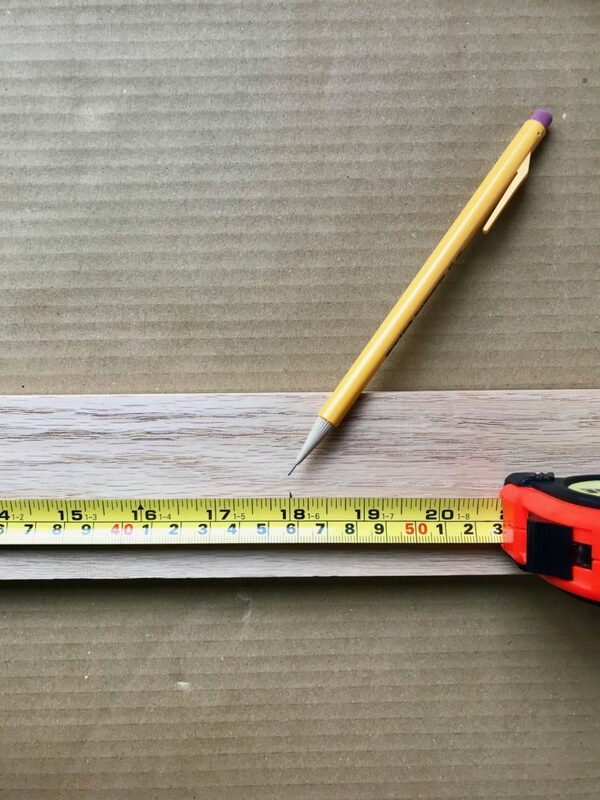 You can make this shelf for under $10 in less than an hour. 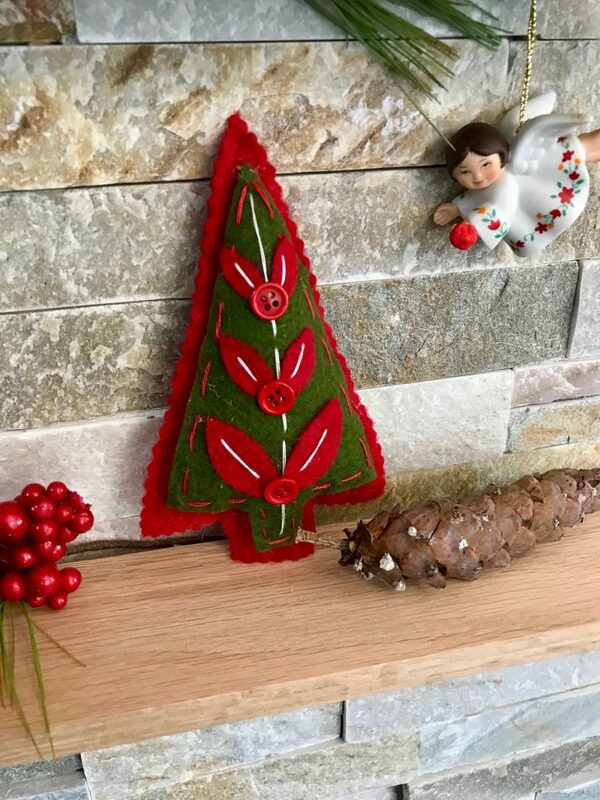 I added ornaments, pine needles, and pine cones to mine to make it festive. 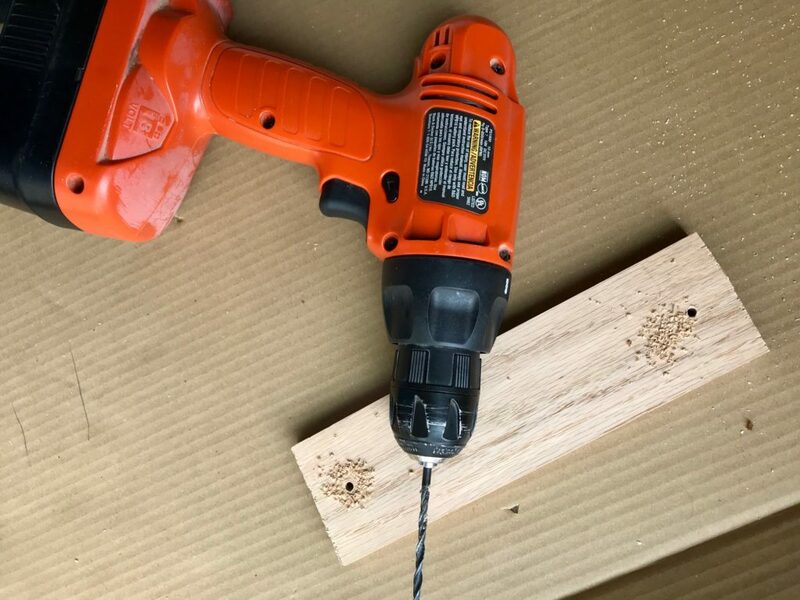 Then drill holes near the ends of each board. Here is something to consider. 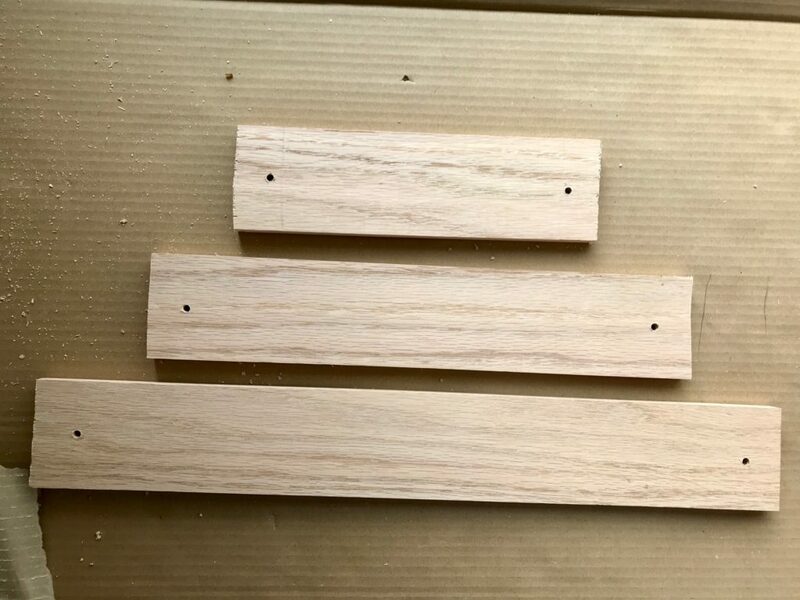 To make the shelves more stable, you can drill two holes in each end of the boards (four total per board). I drilled two holes in each board, and had to carefully place items on the boards to avoid tipping. Once everything was placed, though, I haven’t had any tipping issues. After drilling the holes, I threaded the twine through as shown, putting a large knot on the underneath of each shelf. I started with 9 ft of twine and had a ft or so left over. 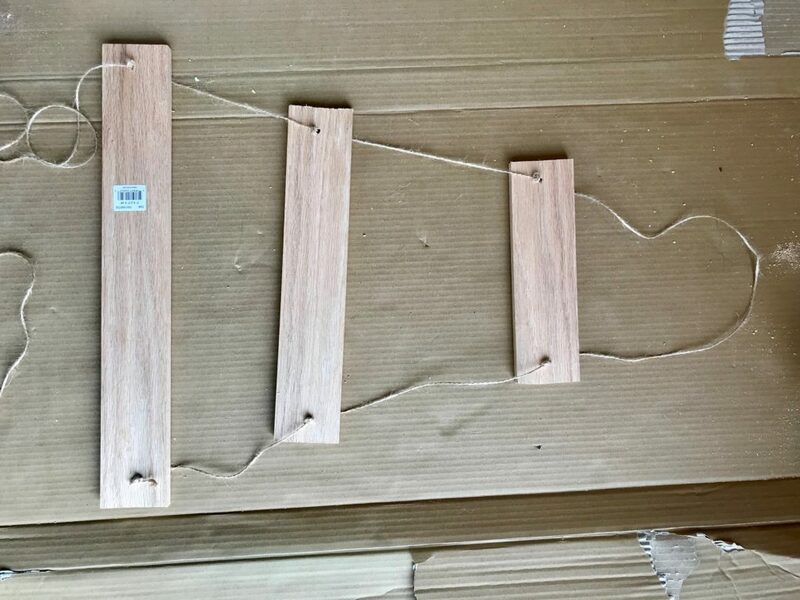 Be sure to leave the same amount of twine between the shelves on each side of the board or the shelves will not hang level. Next, I added small tacks on the back side of each board so that I could hang ornaments on my shelf. I screwed a nail into the wall and hung the shelf unit on the twine. Assess your situation to safely hang your shelf. 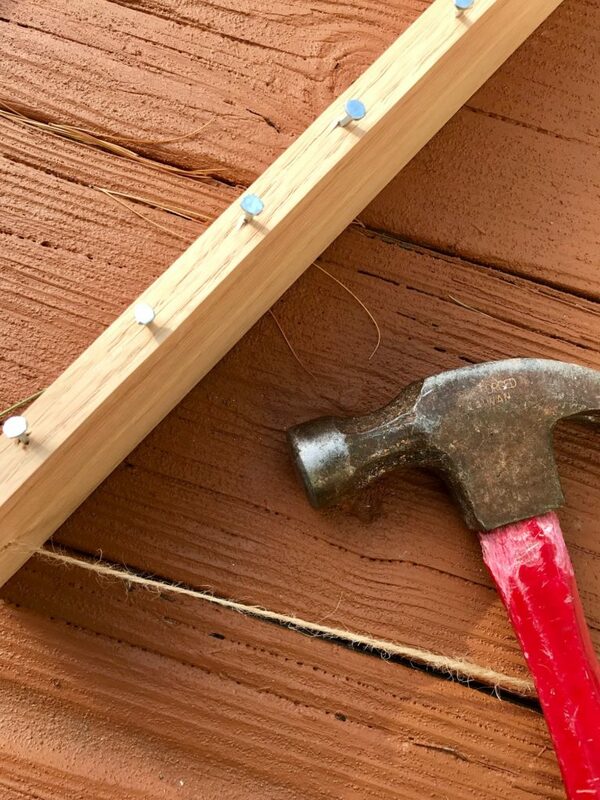 You might need a wall anchor, or maybe just a nail or screw if you locate a joist. This is the joist finder I use–works great. 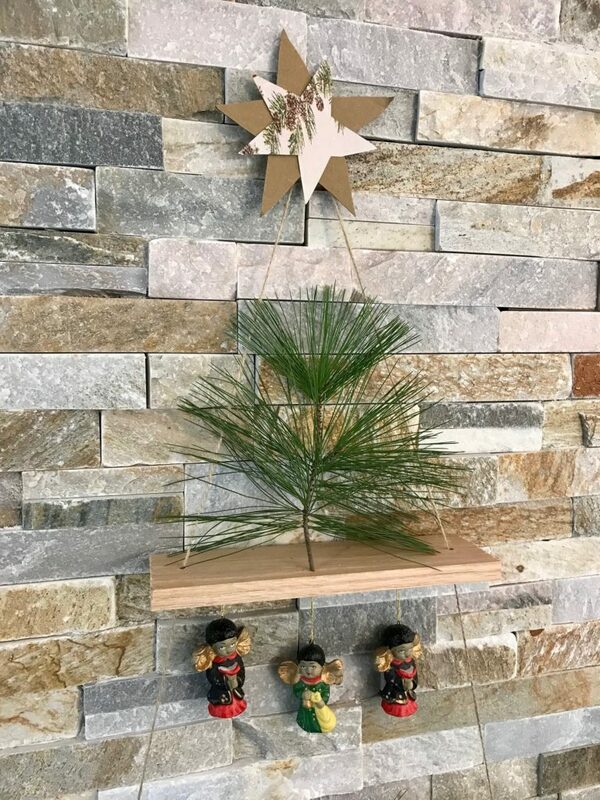 To finish the “Christmas Tree” I cut two stars out of cardboard packaging waste and taped them to the hanging screw. 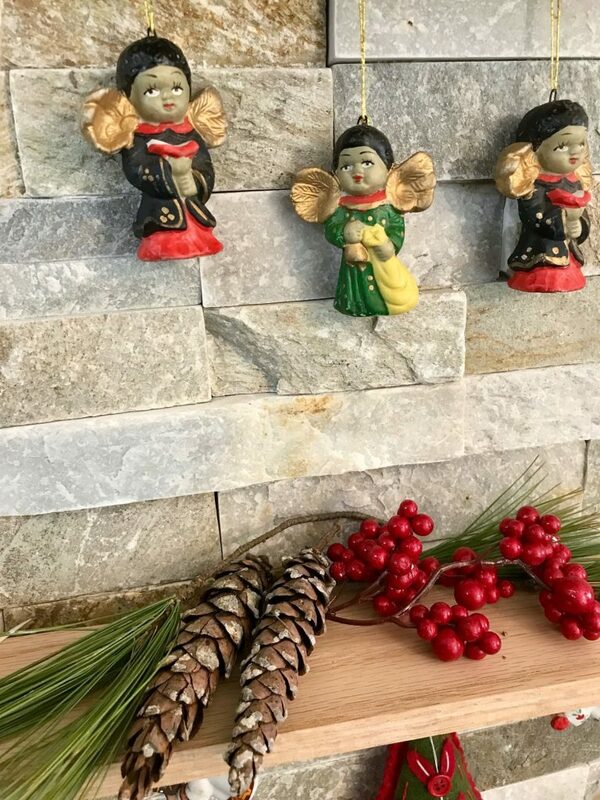 I wish you all the merriest of Christmas and Holiday season! Concrete is a mixture of cement, aggregates (sand or sand/gravel), and water. 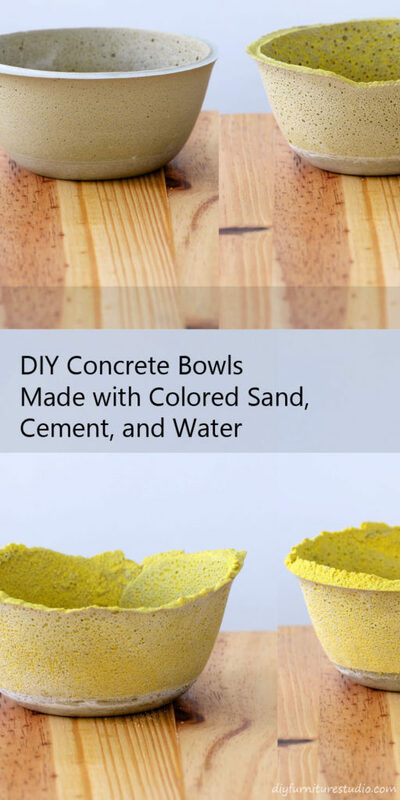 In my seemingly never-ending exploration into colored concrete and cement projects, I made concrete bowls with different proportions of cement and colored sand. 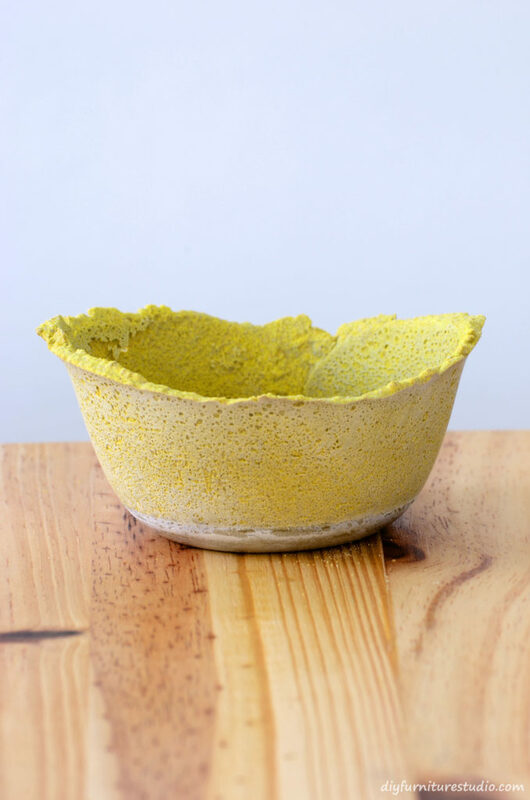 You can see in the photo below that the bowls are different intensities of yellow. 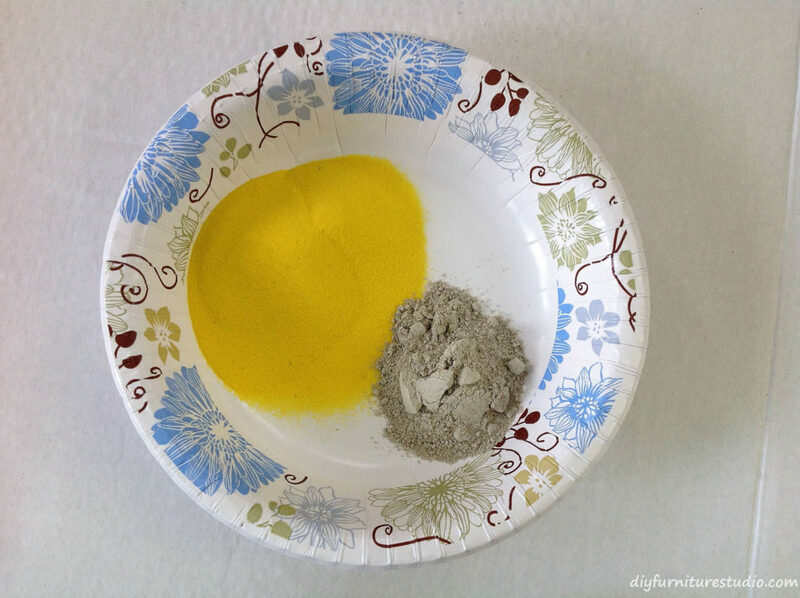 I used 1⁄2 part yellow sand to 1 part cement in the least intense yellow bowl (on the left) up to 3 parts yellow sand to one part cement in the most intense yellow bowl (on the right). At the bottom of each bowl, I put a small amount of uncolored cement for comparison. 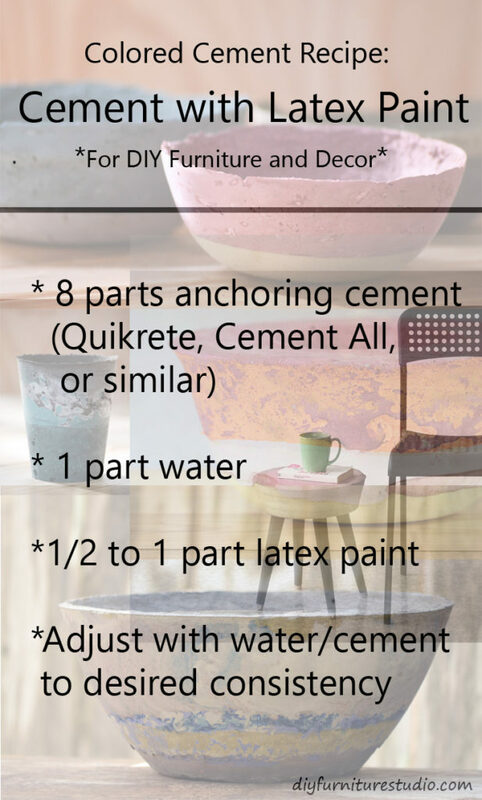 With this information, I hope you can make some really wonderful, colored concrete decor! Details follow. Spray the inside of the cups with cooking spray oil. When working with concrete/cement wear a dust mask and gloves. Choose one of the recipes below depending on how intense you want your concrete project to be. 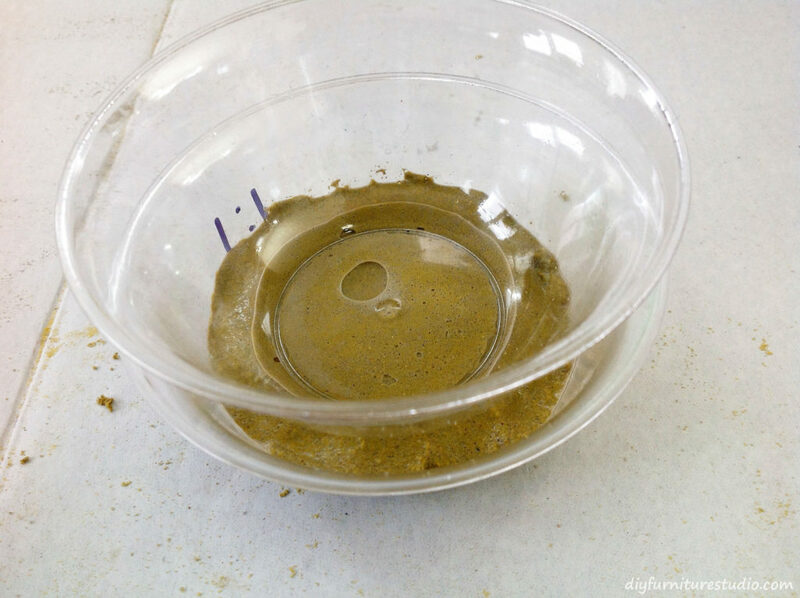 The more colored sand in the recipe, the more obvious/intense the color will be in the finished concrete. For convenience, I made batches of concrete where each “part” was 1⁄4 cup. 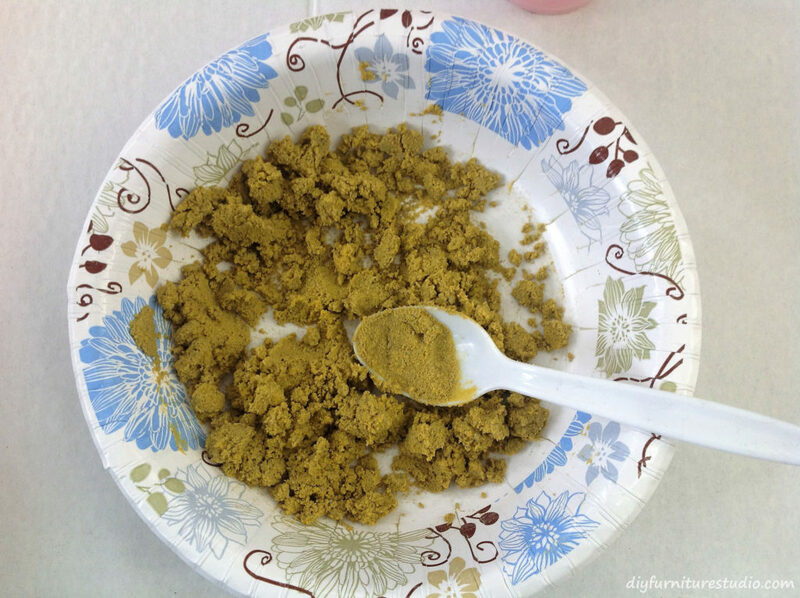 So for instance, for the recipe with the most sand, I used 3/4 cups sand, 1⁄4 cup cement, and 4 Tablespoons water (1 Tablespoon per 1⁄4 cup sand and cement). Put the sand and cement in a mixing bowl. Mix the dry sand and cement. Add water and then mix. 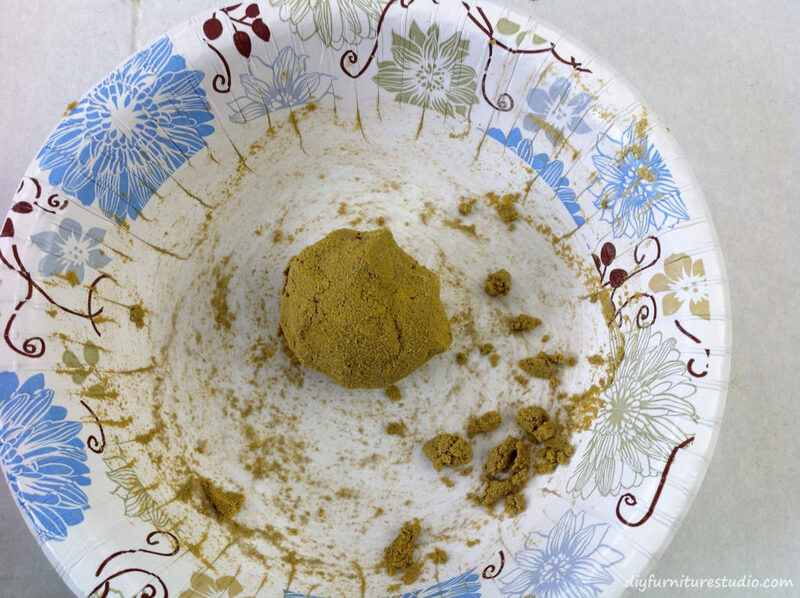 Adjust the consistency of your mix with water or cement, if needed. The consistency of the concrete should be fairly dry. It should maintain its shape if formed into a ball or could be slightly wetter, being able to form a sloppy ball. For molds, I used two disposable plastic bowls of the same size. I first put a little uncolored cement in each bowl, then let that cure about an hour to harden. I did this so that it would be easy to compare the colored concrete to uncolored. You can do this if you like the two-toned look, but it’s not necessary. 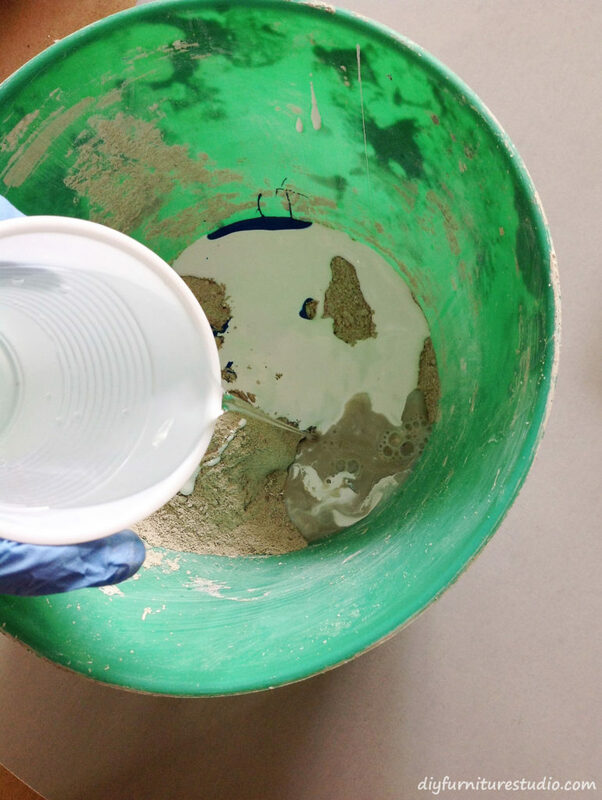 Plop your colored concrete in the bowl that is oiled on the inside, and level the concrete. 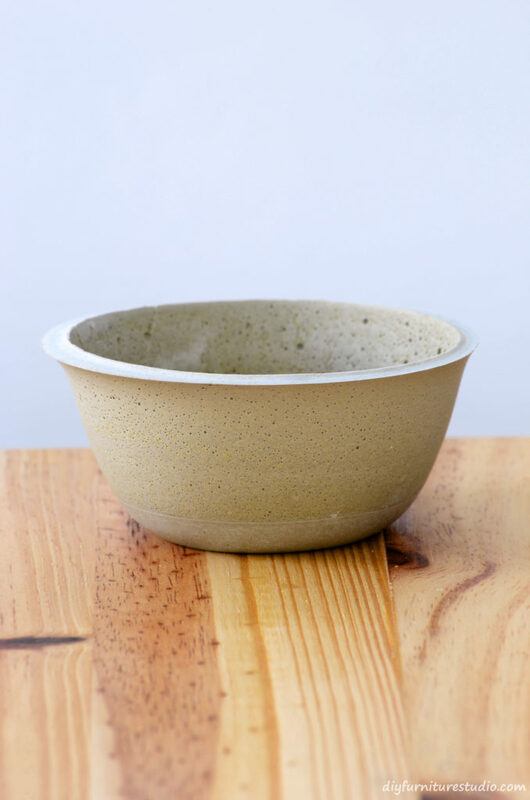 Push the other bowl (oiled on the outside) into the cement. Put something rather heavy (like stones, or in my case another concrete casting) into the inner bowl to weight it and keep it in place. Let the concrete cure for at least a day, then popped the plastic molds off. I always coat my concrete and cement creations with Rain Guard, a silane/siloxane sealer that prevents efflorescence. Efflorescence is an unsightly white powdery film of masonry salts that can form when concrete/cement is exposed to moisture after it is cured. 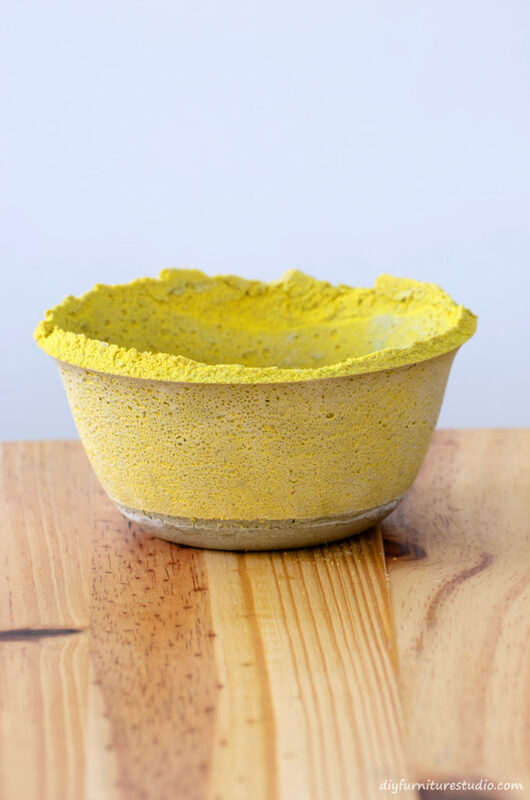 You might be interested in another project using colored sand: DIY Concrete Cake Stand or Centerpiece with a Changeable Base. 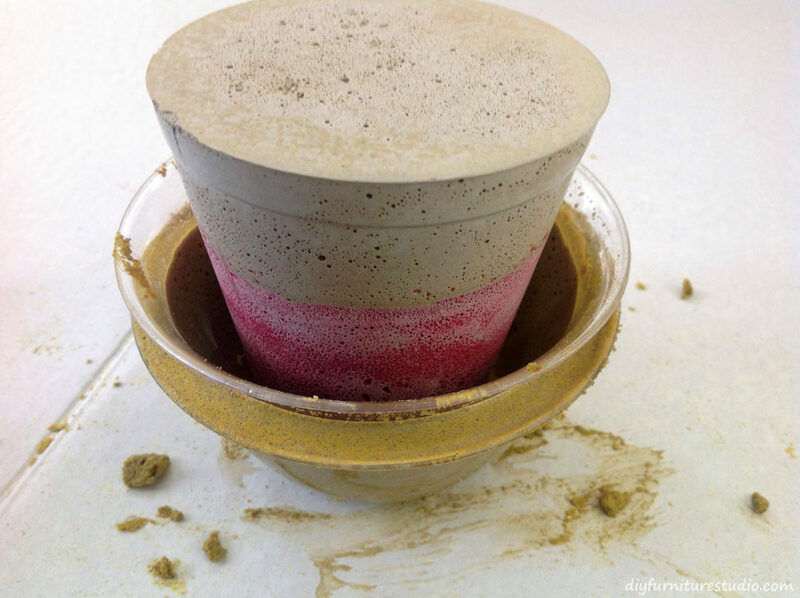 This was my first project using colored sand in concrete, and I used a low concentration of sand for a subtle look. Stop back soon! As always I hope you are having a great day! It’s probably no secret: I love colored cement. 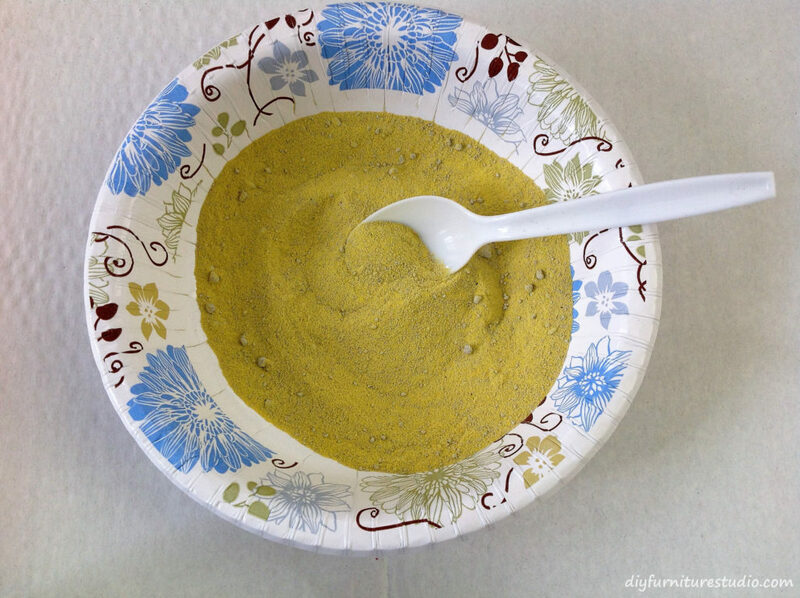 Using ordinary latex paint as a colorant is beyond economical and convenient for small batch cement projects like the one I’ll show you today. With paint in the mix, the finished piece is colored, and yet the texture of the cement is also there. Earthy and primitive like cement tends to be, yes–but also interestingly colored. 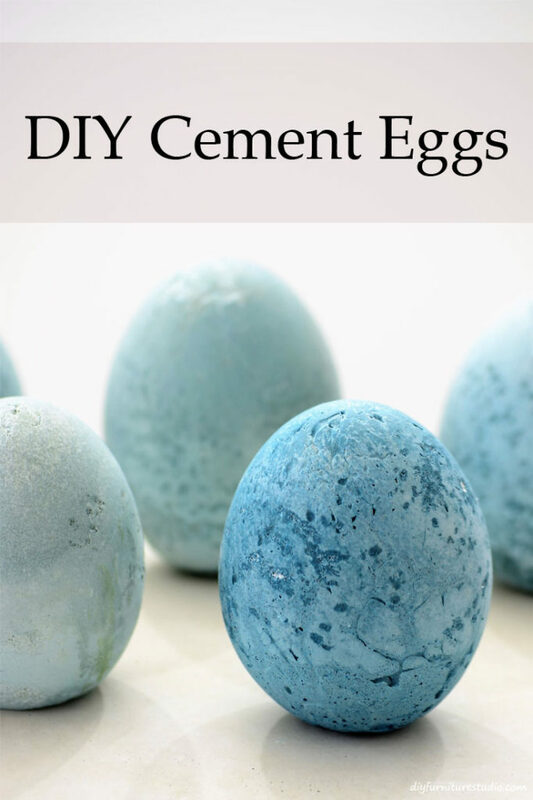 In this project, I’ll show you how to make colored cement eggs, which are especially popular this time of year with Easter and Spring just around the corner. 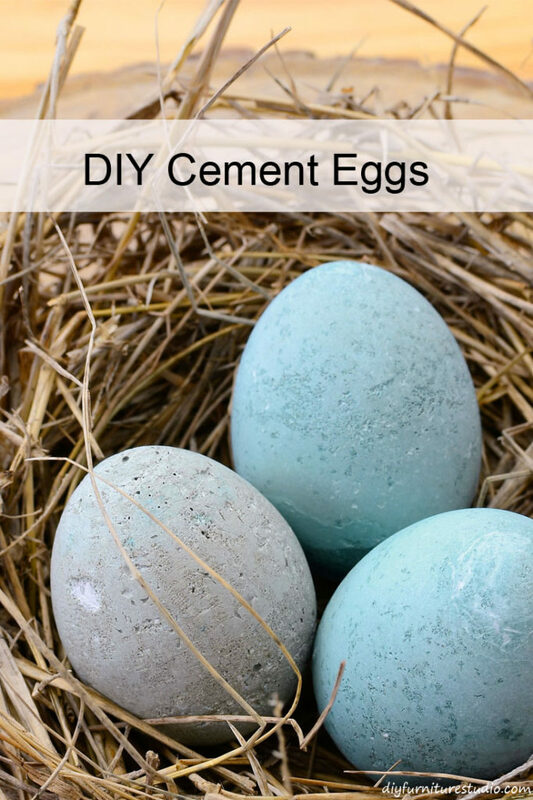 Of course, these cement eggs can be used to decorate your home throughout of the year. The type of paint to use for coloring cement (and concrete) is latex paint. Most interior wall paints are this type of paint. 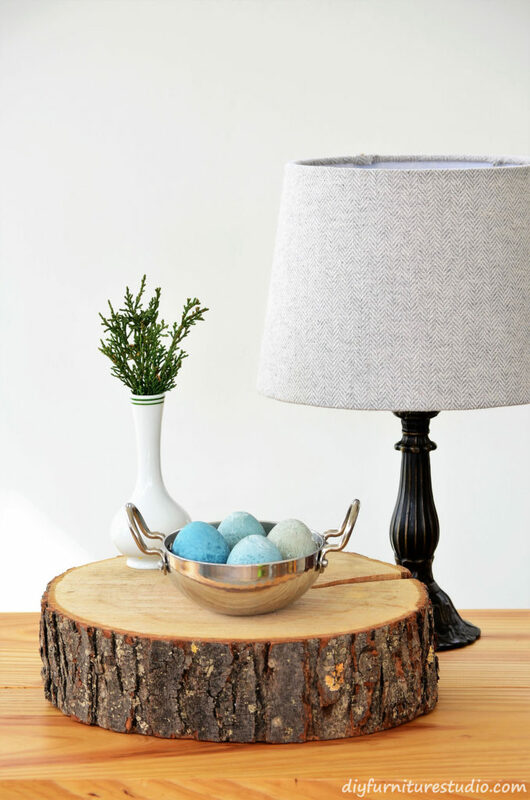 Leftover paint and sample-size jars are ideal for this project because you don’t need much. 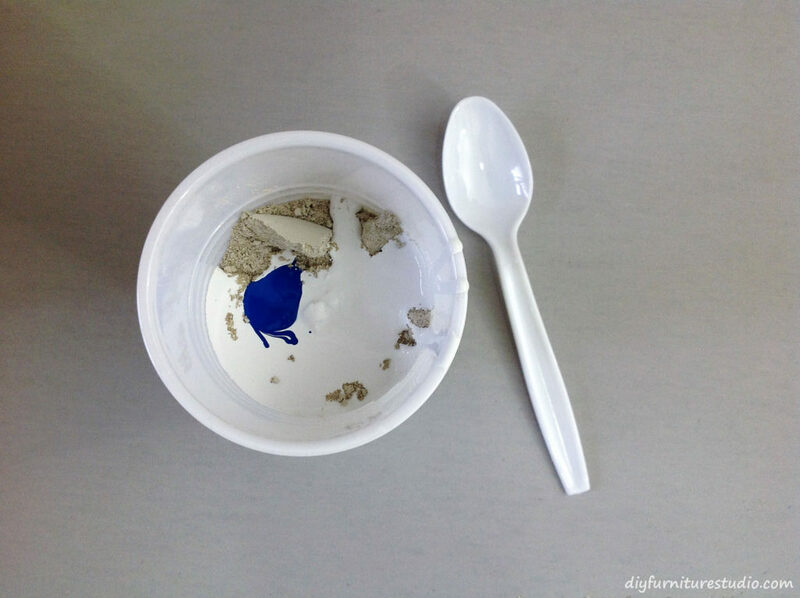 You can also use acrylic latex paint in little containers that you can find at craft stores. 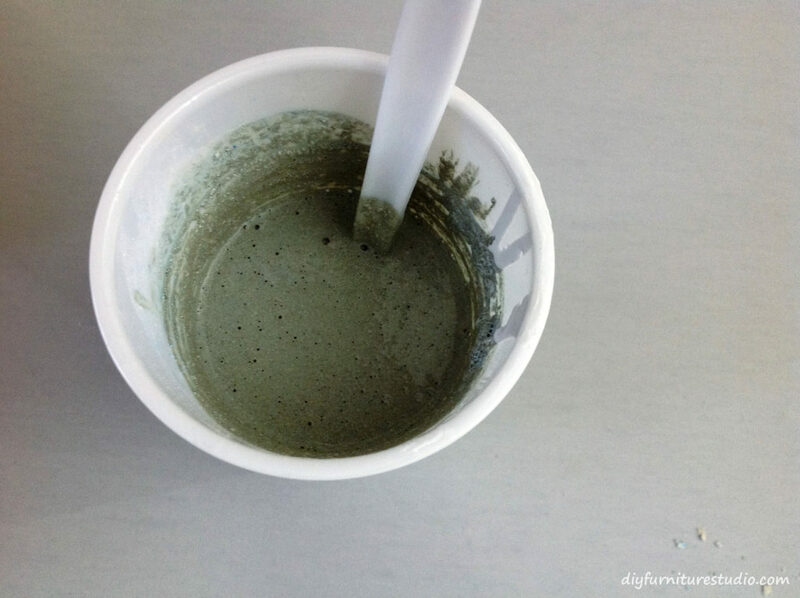 When paint is added to the cement in the mixing process, it tints the cement, giving a muted version of the color and sometimes an unexpected color. 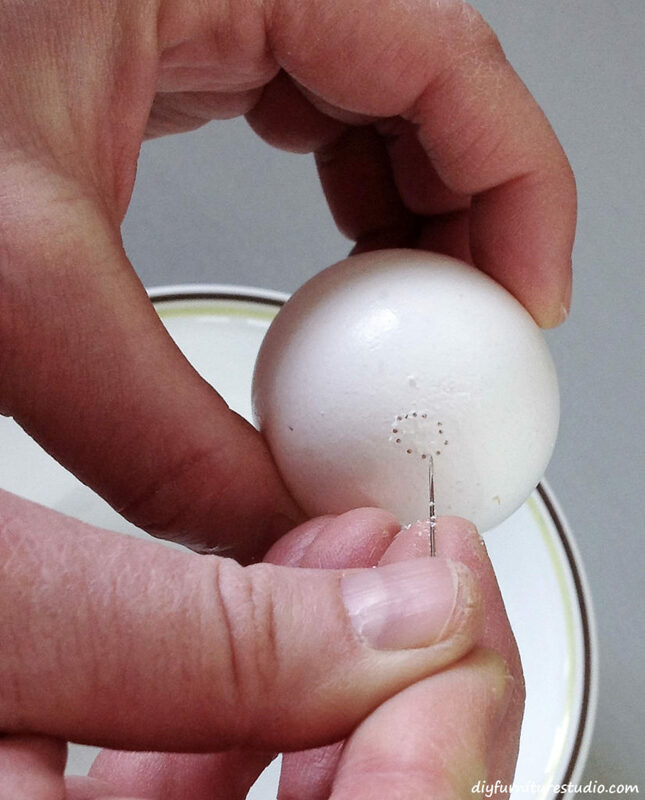 Using a pin with a ball head, poke one hole in the end of the egg that is more pointed. 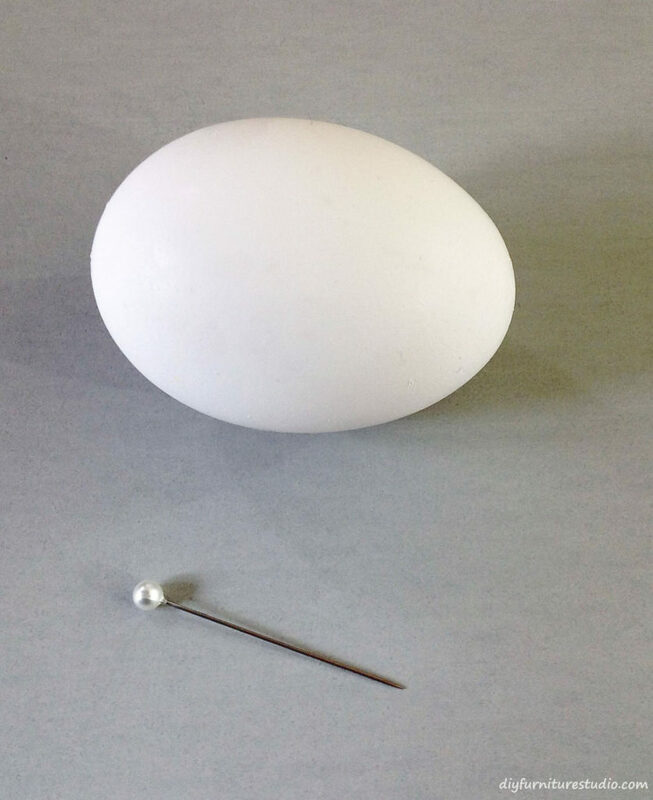 On the other end of the egg, use the pin to poke holes in a circle shape, roughly 1⁄2 inch diameter, as shown in the photo below. Then go back and poke more holes very close together (between other holes) around the circle. Eventually you will be able to pop the circle out, leaving a nice circular hole in the egg. 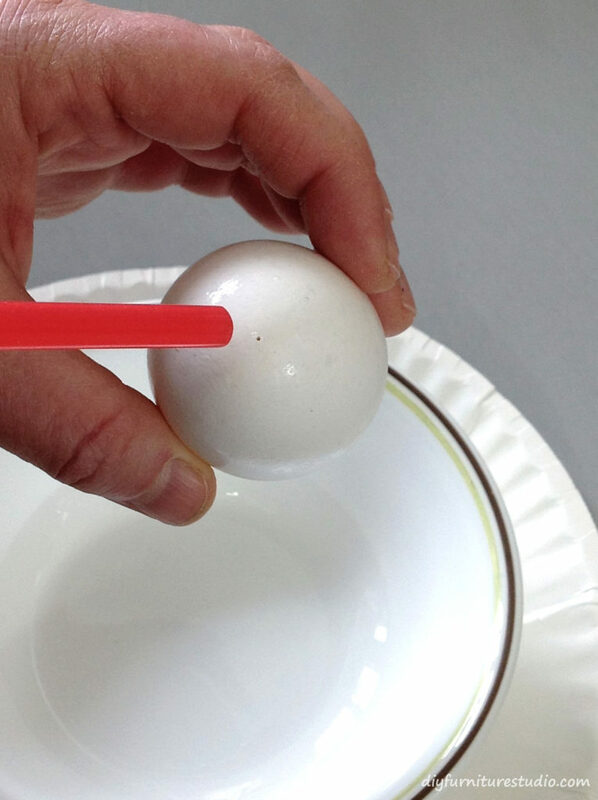 Next, position a straw over the hole on the pointy end of the egg and blow the contents out through the larger hole. 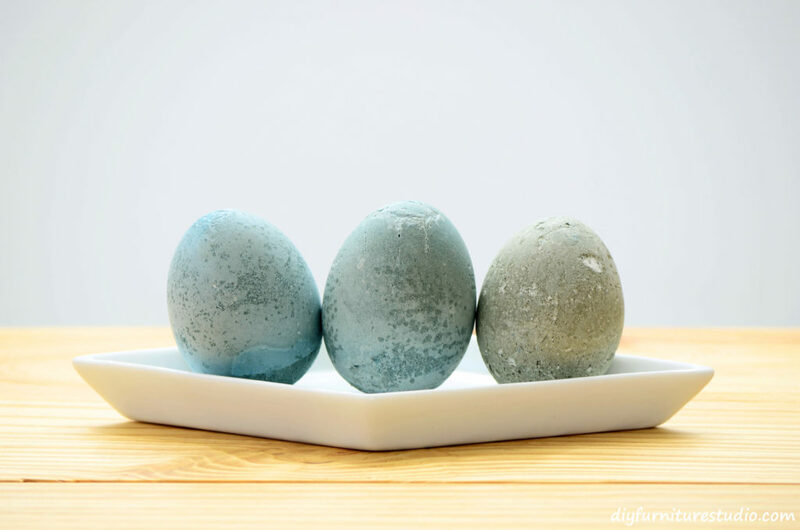 Rinse the eggs with water, then put a small bit of tape over the single hole in each egg so cement doesn’t leak out after the pour. 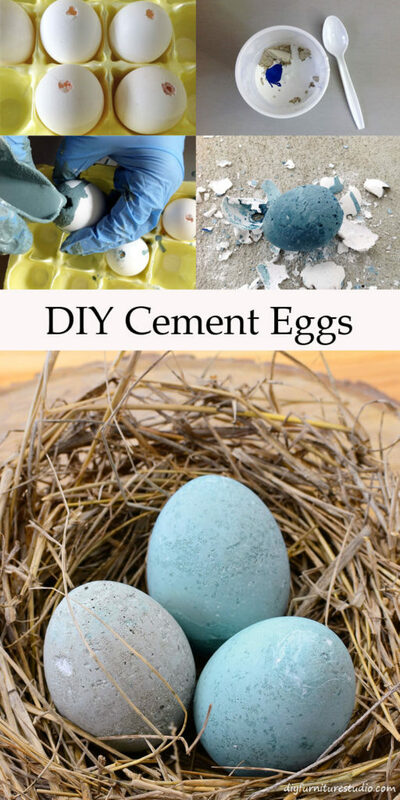 The amount of dry cement you will need is roughly 1⁄4 cup (2 oz) for a small egg, 1⁄3 cup (about 3 oz) for medium and large size eggs, and 1⁄2 cup (4 oz) for jumbo size eggs. I used three different egg sizes: medium, large, and jumbo, and I generally made cement batches big enough to fill several eggs. This size batch will fill two to four eggs, depending on the size of eggs. 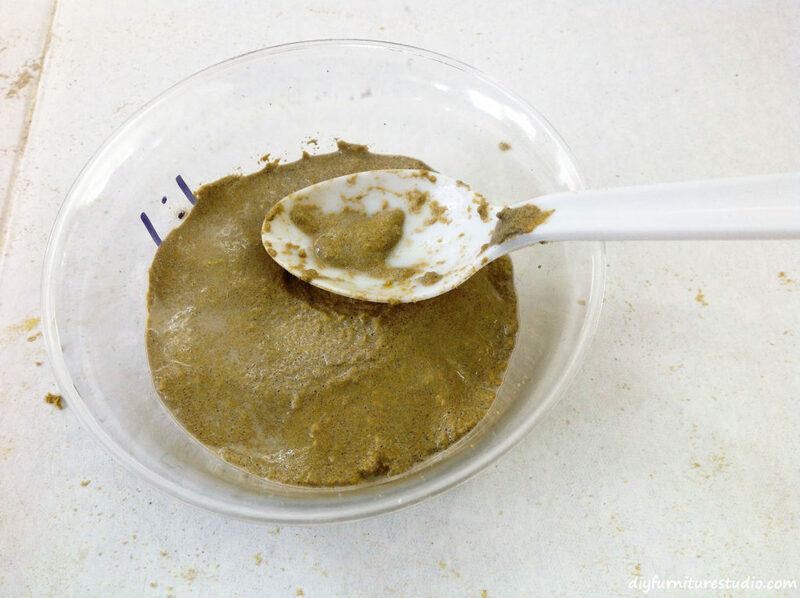 To mix a batch of cement, first put the cement in a mixing bowl. Next, add the paint to the mixing bowl. (I used blue and white paint in different proportions for my eggs. 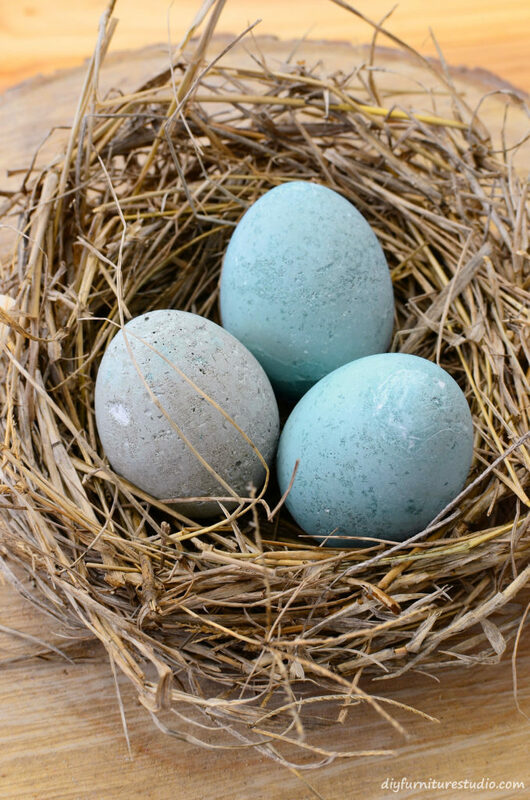 As an aside, the eggs turned out a surprising variety of colors using only the same two paint colors.) Then add a small amount of water and mix. I usually mix with a gloved hand, but a spoon or stick works well also. 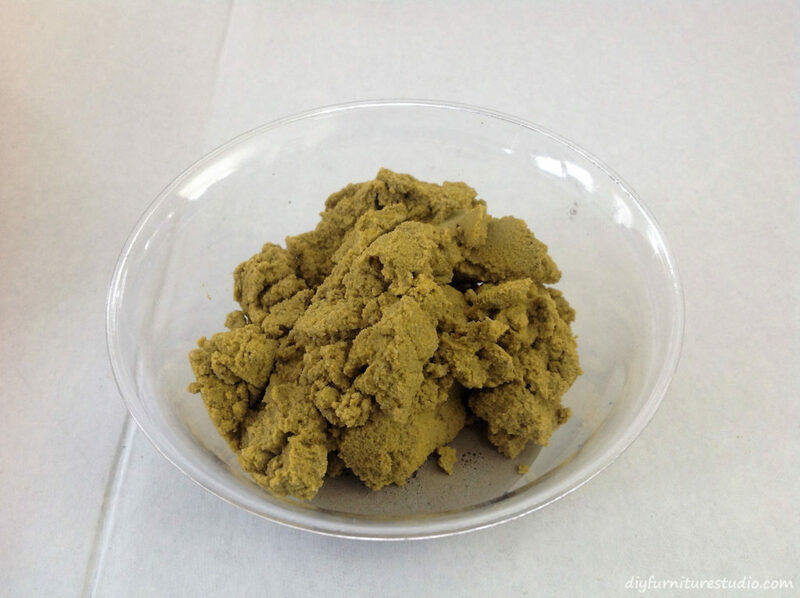 I like to mix the cement batch initially to a crumbly cookie dough consistency, then add more water to adjust the batch to the consistency I want. For the eggs, I adjusted the batches to a pourable state, like a runny pudding. 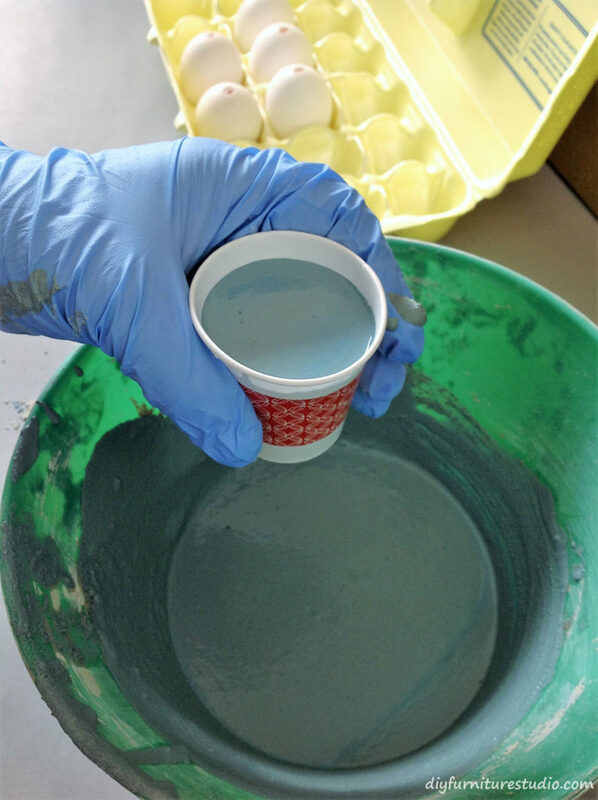 I transferred the colored cement into a small disposable cup, and then poured the cement into the eggs. 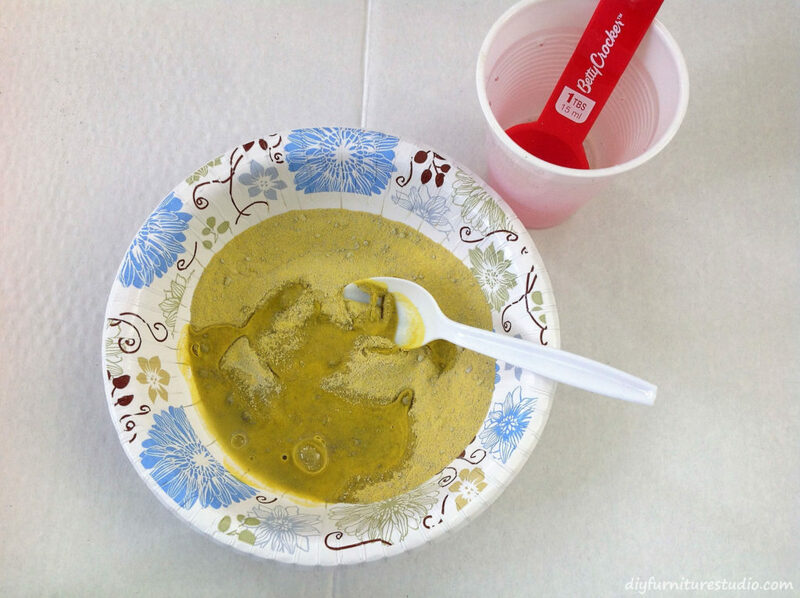 When I made smaller batches, I used a disposable plastic cup rather than a bigger mixing bowl. I could pour the cement into the eggs from the cup. 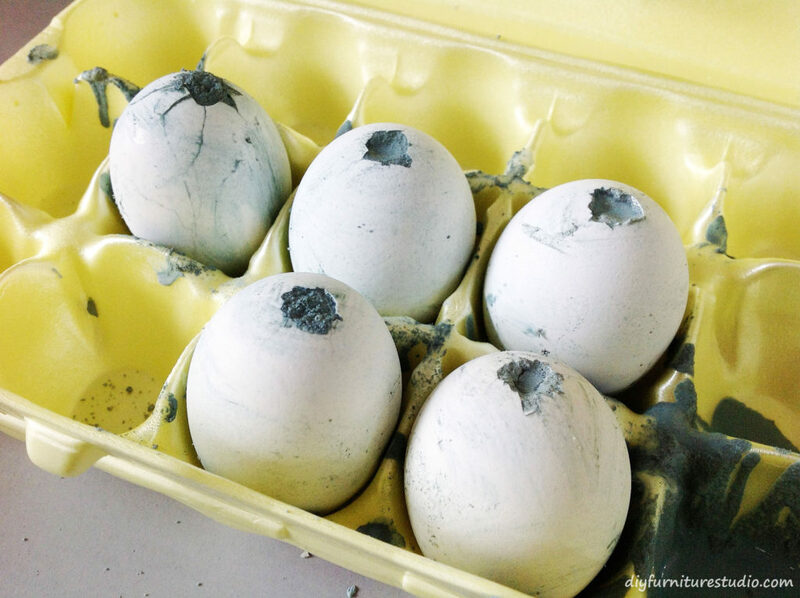 After pouring the cement, I wiped off any cement from the outside of the eggs with a paper towel. Let the eggs cure at least 3 hours before removing the shells. 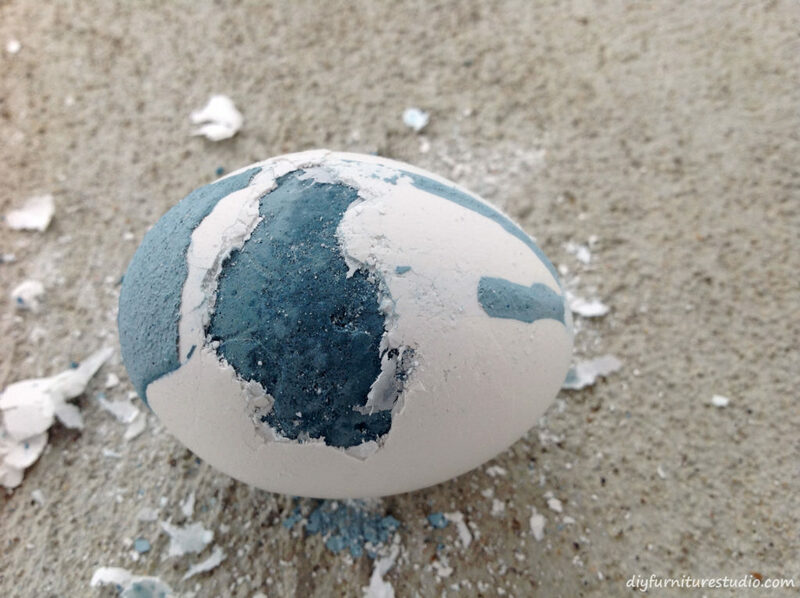 I have an easy way to get the eggshell off the cement eggs. But first let me tell you a method that is a pain in the rear. Get a knife or file and pull the eggshell off in little chunks. 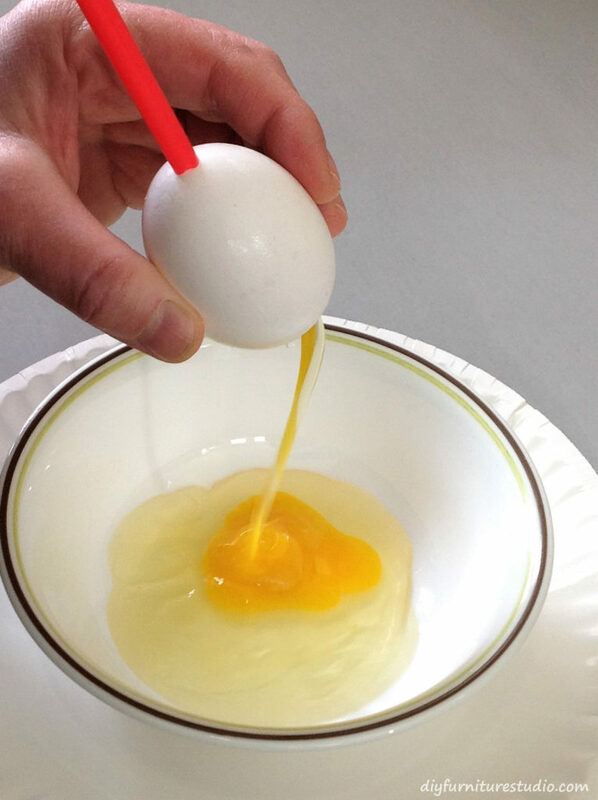 It will take about 15 minutes (or more) per egg. You will get weary thinking you shouldn’t have made so many of the lovely egg creatures. You will remember the phrase “work smarter, not harder,” and it will eat at you all the while you are pick, pick, picking at the shells. So here is how to do it smarter. The cement is harder than the shell. This is the key. 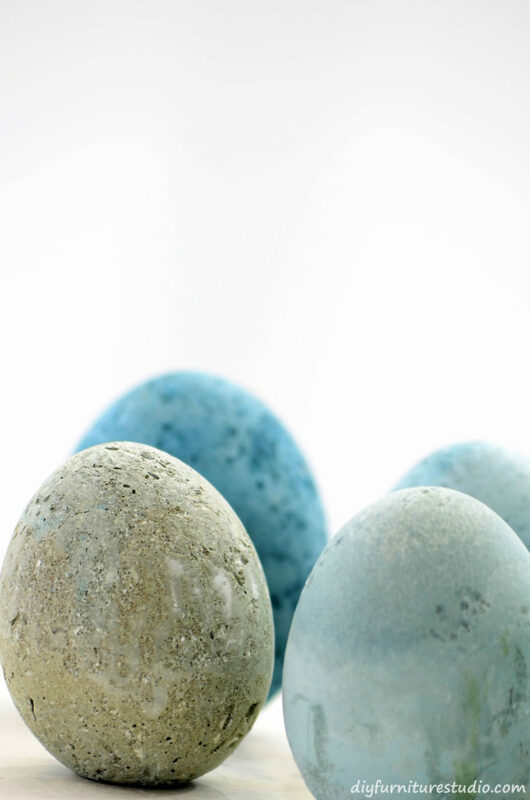 Take the eggs to a patch of concrete or other hard surface. I did this on my front porch which is rough cement. Rock the egg against the surface giving it some pressure. 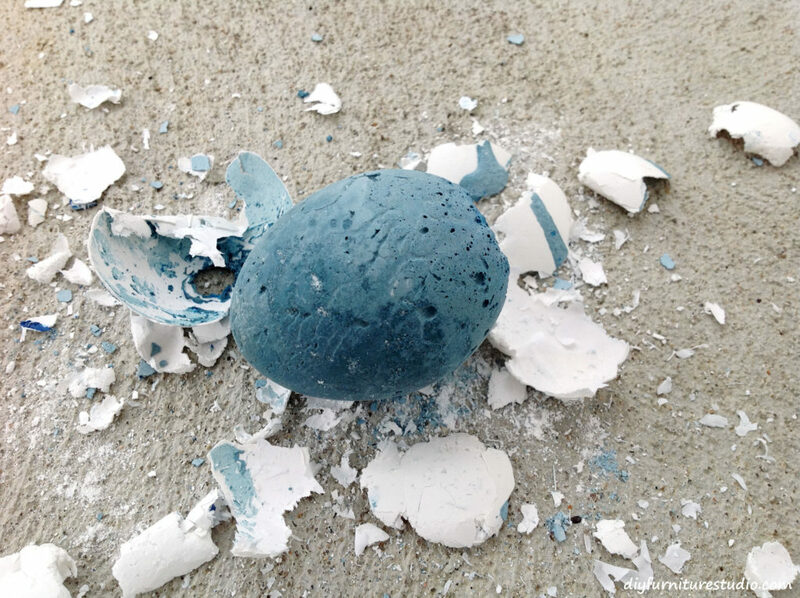 The eggshell will crush into a powder. 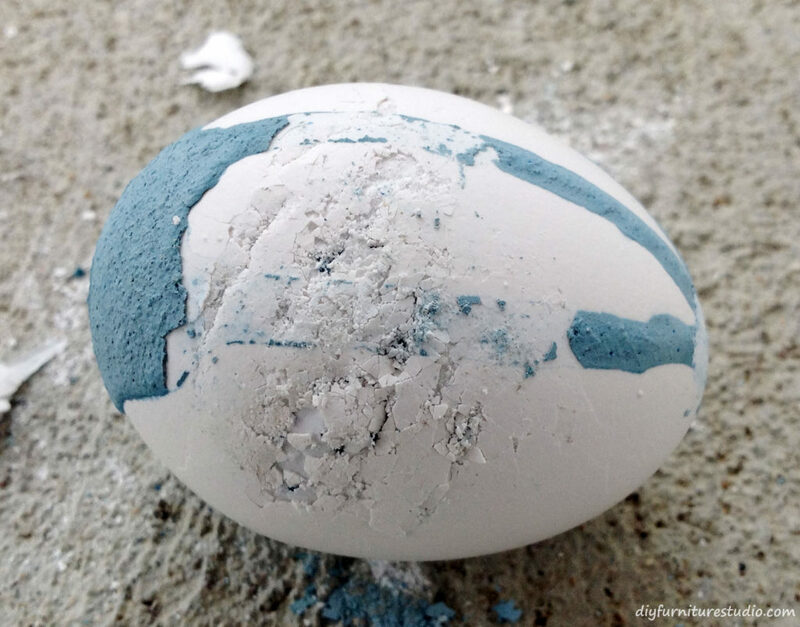 Wipe off the powdered egg, and rub a new section of the shell into the hard surface. Continue until all the eggshell is off. 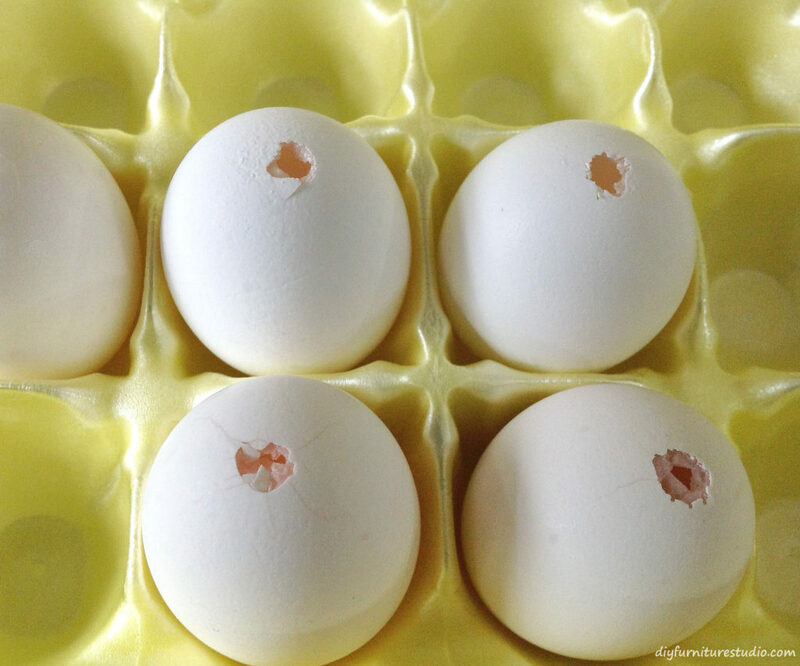 Some of the eggshell may come off in larger chunks. Removing the shell using this method is super fast and easy! After removing the shells, I washed the eggs with water to remove any remaining debris. 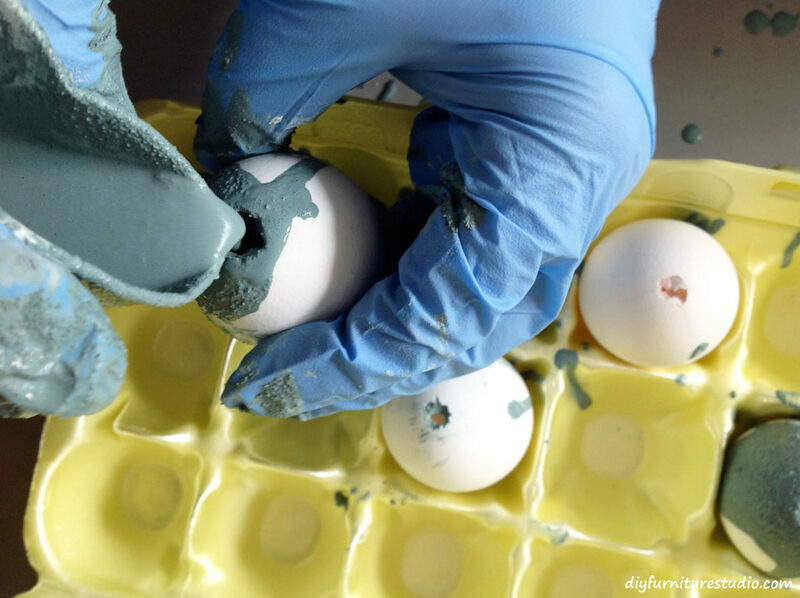 The last thing I did was seal my eggs with a silane/siloxane concrete sealer. This is optional. 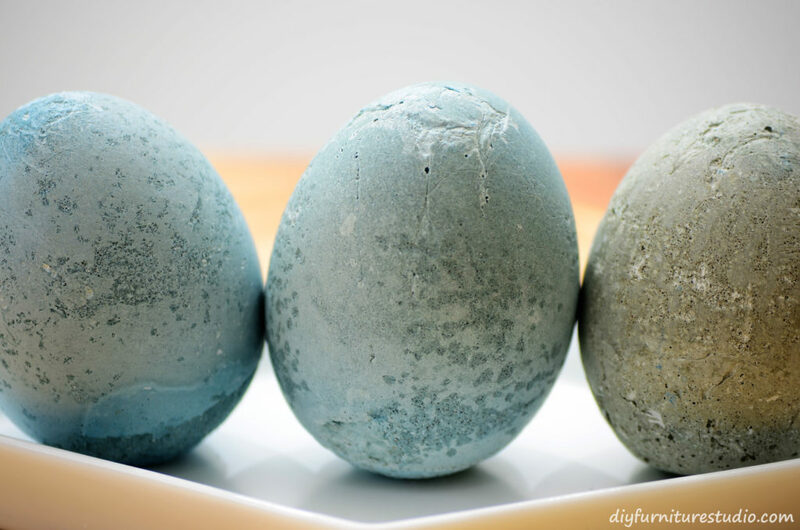 If any of you try waxing your eggs (or use a different sealer), let me know how it worked out. I have been wanting to experiment with waxing cement/concrete but haven’t gotten to it yet. Well, this sure was a fun project for me, and I hope it is for you, too! As always, thanks for stopping by and staying a while! 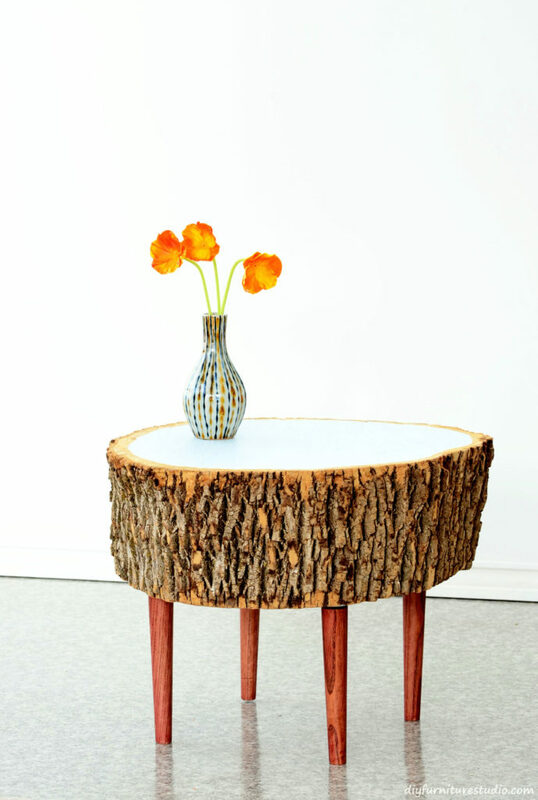 Making this live edge stump table was a challenging endeavor for me, but not how you might expect. I decided to do minimal processing of the stump. That meant no taking off the bark, no leveling with a router, and for the love of all things good–no sanding! Yes, I almost blew it with the sanding. I broke down and got the sander out. But I needed a longer extension cord, and looking for it slowed me down just long enough to come to my senses. So you understand, I would normally sand a stump like this for hours to get it flat and smooth. But this time, I wanted to go in a different direction. 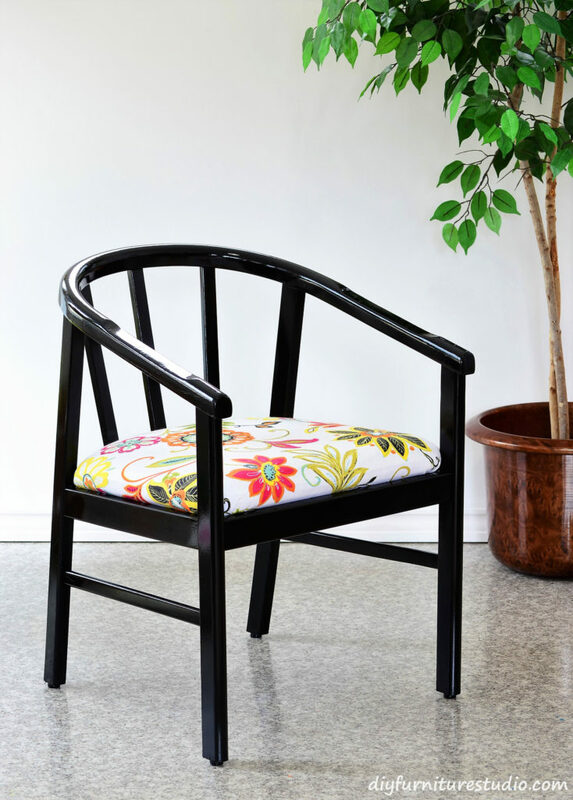 This is a makeover project, and this chair was long overdue. I bought this chair for $10 about 20 years ago. Soon after I bought it, a friend recovered the seat with a neutral, if not boring, fabric. We used it for a few years, then it ended up in the basement for at least the last 10 years. No one sat on it. It was up against the wall by the ping-pong table, and balls always seemed to get caught underneath it. I really liked the chair, though, and that’s why it survived many rounds of purging at the second hand store. For the makeover, I did a simple refresh of new paint and new fabric on the cushion.